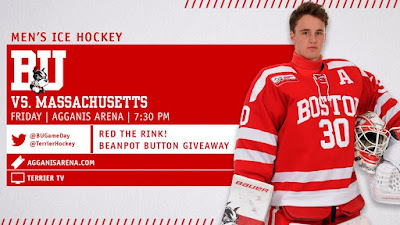 ► Episode 11 of Inside BU Hockey features Bernie Corbett and Albie O'Connell discussing tonight’s match-up with #2 ranked Massachusetts and Monday night’s Beanpot opening round game against defending champion Northeastern. After earning just one win and three ties in their first seven games, the Terriers have gone 13-3-3 to become one of the hottest teams in Division 1. BU and UVM played a weekend series at Walter Brown Arena in November with BU winning the first night, 3-0, and tying the Cats, 3-3, the next night. Jesse Compher with 43 points and Sammy Davis with 33 pace the Terrier attack. Freshman Mackenna Parker has contributed four goals and two assists in the last five games and has eight goals overall.